The behaviors we observe in our economy, our markets, our firms and our lives result from the policies and structures we create to manage ourselves. Unfortunately, the complexity of it all makes prediction and understanding quite difficult. At Dynamic Forecasting, we model system structure in an effort to understand and predict how our social systems are likely to behave over time -- the dynamics of it all. 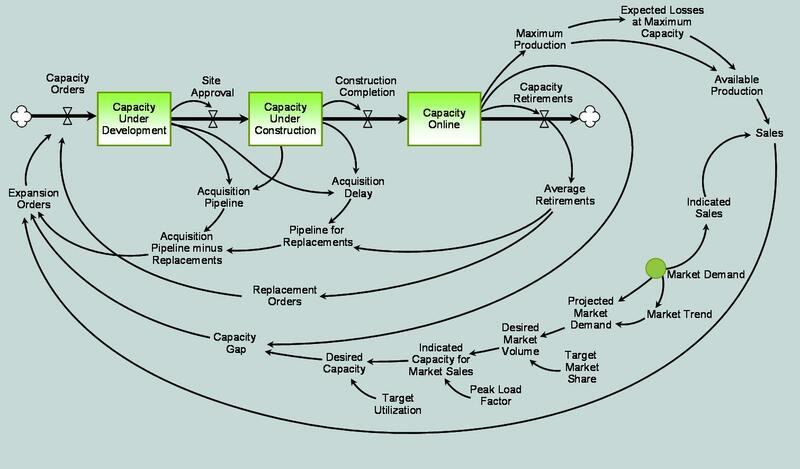 The below diagram depicts a very simple structure underlying the ordering and construction of power plants. This simple model can produce oscillations in ordering and capacity -- a boom bust cycle often observed in reality.